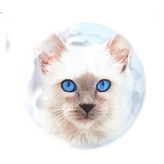 With the growing popularity and demand of our cats, we have come to educate and provide many families with the hope of having a beloved companion through their acquisition of a Balinese cat. Our breeding program has been focused in producing quality kittens and it includes producing cats that have been proven to produce hypoallergenic offspring. 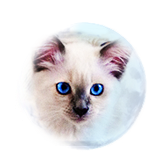 This page provides information regarding the Balinese cat breed's hypoallergenic quality and options for those that would like to confirm, test and visit our cats. To better understand why the Balinese cat breed is considered to be "hypoallergenic", we must first define the word hypoallergenic. According to the Merriam-Website dictionary, the word hypoallergenic is define as "having little likelihood of causing an allergic responce". A "hypoallergenic" cat is considered to be a cat that has the least likelihood of causing an allergic reaction. Though a cat breed "can" be regarded as hypoallergenic due to its hair quality, hair or no hair, coarse or soft, etc. we must keep in mind that all cats produce protein allergens that may cause allergic reactions even if they have or do not have hair or whatever their coat quality may be. These protein allergens are encoded and/or referred to as Fel d 1 (cat saliva, sweat glands) and Fel d4 (urine and other glandular secretions) which may cause allergic reactions in humans when cats produce and shed the allergens. There are other protein allergens besides Fel d 1 & Fel d 4 that cause other allergic reactions in humans but are not as apparent in producing cat allergies. Though you may wonder how it is possible for a medium to long-haired cat breed such as the Balinese cat to be considered hypoallergenic, hair quality has nothing to do with the production of the protein allergens. With that being said, though there are some websites that have stated and have promoted that the hairless Spynx, Rag-Doll, Russian Blue, Oriental, Siamese and other cat breeds are considered hypoallergenic, we have concluded that the only 2 cat breeds that are true and genetically hypoallergenic are the Siberian and the Balinese cat breeds. Proof is in the testimonials brought forth by the breeding and pet ownership community of these 2 cat breeds in the past decades. Siamese cats are not considered to be truly hypoallergenic and many Siamese and Balinese cat breeders and owners of both breeds are aware of this. Siamese cats that are bred to their long-haired counterparts produce short hairs (Siamese or Short-haired Balinese) that may be hypoallergenic. Here at Azureys Cats, our theory is that the Balinese cat's long-haired gene is associated with the production of lesser amounts of the protein allergen. This gene or genes being passed down to a Siamese/short-haired offspring may result in a hypoallergenic Siamese cat. Balinese cats are considered to be genetically hypoallergenic as they genetically produce lesser amounts of the protein allergens normally found in cats. The Balinese cat breed is not only a beautiful and highly intelligent cat breed, but it has become renowned by its rare and special hypoallergenic quality. Keep in mind that though the Balinese cat breed in considered Hypoallergenic; or less prone to causing an allergic reaction, there are other factors that could affect someone in terms of an allergic reaction, this includes their immune system. Just because a cat is hypoallergenic, or produces a lower level of the allergens does not guarantee you will not get an allergic reaction. People with suppressed immune systems as well as those that are extremely allergic to cats, food or other animals might still become allergic to a cat that produces much lesser amounts of the protein allergen. Keep in mind that intact (unspayed/unneutered) Balinese cats produce higher amounts of the protein allergens though much less than a regular non-hypoallergenic house cat. Once altered, these cats will produce even lesser amounts due to the hormonal changes that supress the production of higher protein allergens. Intact females produce lesser amounts of the protein allergies than that of intact males and once altered will produce lesser amounts than that of an intact female. Intact males produce higher amounts of the protein allergens when intact, but once altered, males should produce an amount equal if not lower than that of an intact/altered female. We have had numerous past kitten parents who had tried everything possible in order to have a kitten/cat and/or other animals but because of their allergies it made it impossible for them to do such. 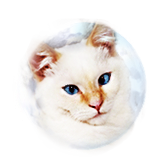 By breeding and producing Balinese cats, as well as short-haired Balinese cats that are considered hypoallergenic we have placed many cats with families that never in their minds did they think would be able to have and keep such a pet. 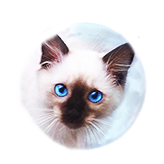 Though we have been able to accomodate many without having them to visit prior to reserving or taking home a kitten, it is advisable that if you have extreme allergic reactions to cats, that you test the Balinese cat breed prior to proceeding. 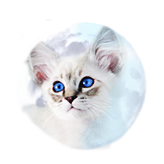 Though currently there is not a single test or finding that can guarantee a specific kitten or cat to be hypoallergenic and provide guarantee of such, the most common protocol that Balinese cat breeders have followed is in having visits and cat hair tests. Though not a guarantee, these "Allergy test" kits can help you determine if having a Balinese Cat will affect your allergies in any way. We promote and support the testing of your allergies with our cats as reputable breeders making sure you take the steps neccesary prior to you acquiring one of our kittens/Cats. Please keep in mind that you are testing your allergies with cats from our breeding program which include our breeder cats, breeding lines and genetic combinations. We make no representation of Balinese cats outside our breeding program and their hypoallergenic qualities nor the probability of using our tests and acquiring a kitten or cats from another breeding program.